**Some of the links in this post are affiliate links. All thoughts are 100% my own. If you've been following along on Instagram, you know that my journaling time in the last few months has been very limited, to say the least. Back in November, after just 2 days into the 100 Days of Grace and Gratitude journal, I broke my collarbone on my dominant side leaving me unable to use my left hand. The healing process is slow and ongoing, but I have at least found ways to adjust and position myself to where I am able to journal. Oh, how I had missed it! 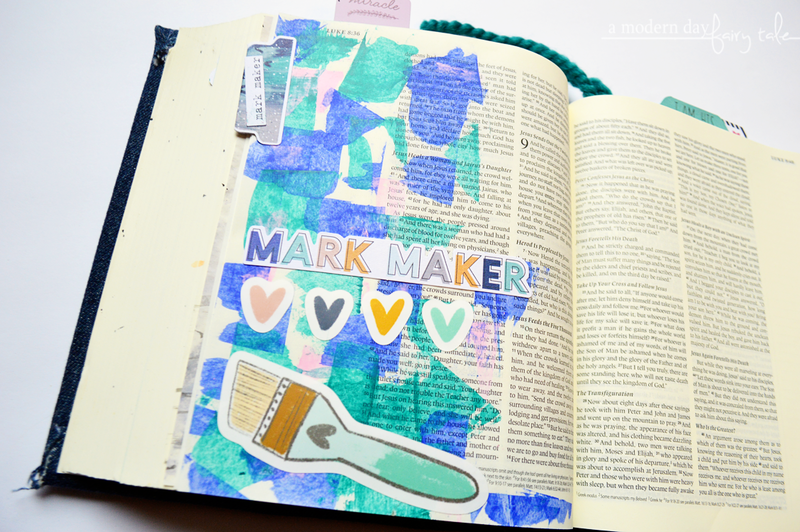 I have loved working through the Illustrated Faith devotional kit, Mark Maker... all about the marks that God puts in our life. My favorite thing about this one is that the devotional features multiple verses and prompts so you can really do a LOT of journaling in each section. While the physical kit has sold out, you can still download digital content for Mark Maker here. I love the colors in this kit and really tried to bring them out on this page. My favorite part though is the small detail of adding the die cut words onto the tab. This is such a simple, possibly overlooked detail, but I loved it! 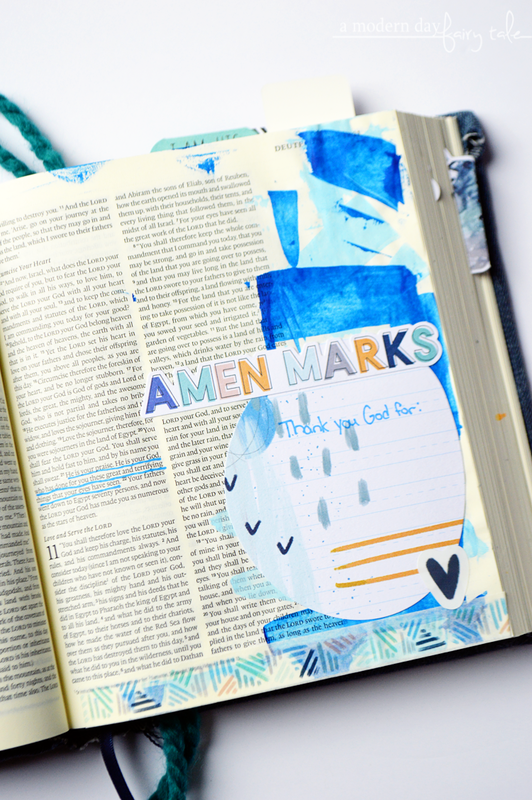 This page was all about remembering to take a look at the marks that God has made on our life--- good times and bad. 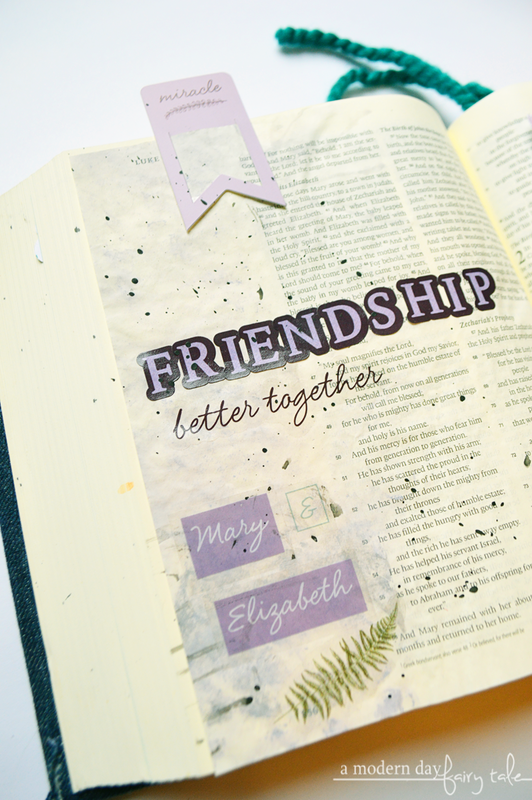 I used this die cut to create a little journaling space, to be used AFTER the photo was taken to share. This was another page based on one of the devotions in the Amen Marks section of the devotional, but admittedly, style wise it didn't quite match up. 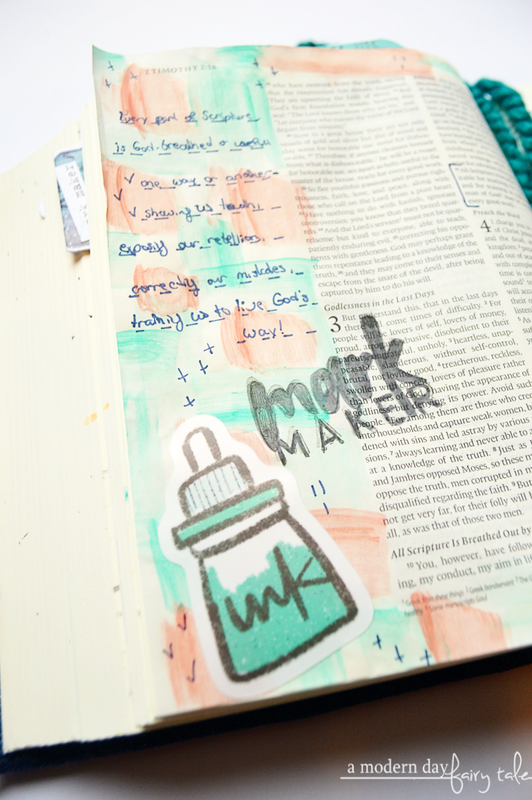 That's the great things about these devotions though... you can use whatever you have aside from the kits to make them your own as well! In addition to the Illustrated Faith kit, I've also been making my way through the Dayspring kit, which takes a look at various women throughout the Bible. This is kit 1 of 3, and I am really enjoying it so far. You can still grab this first kit here. 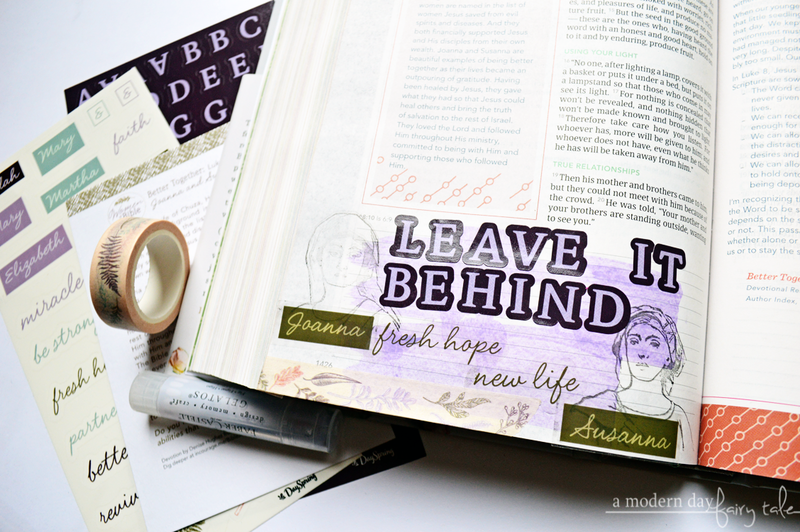 For this page, looking at the story of Joanna and Susanna, I did some journaling in the (in)courage Bible, which gave me a completely different layout to work with. Though I'd read this story before, they weren't people that stuck out to me, so I really loved getting to 'know them' a little better through this study. What a great message it is--- to leave it all behind and follow Him. It's a scary idea, but the rewards of a fresh hope and new life certainly make it worth it. This page, telling the story of the relationship between Mary and Elizabeth was ONE of the first pages that I'd done since November, so I was keeping it very simple. Though it didn't come through in the photos, I created a very simple and subtle background with the light silvery/lavender gelato included with this kit and added some stickers to complete this simple look--- with room to go back and add in a few thoughts as I am able too. In addition to these two devotionals, I am working on plans for some LOVE journaling, in the spirit of Valentine's Day of course and practicing a few other techniques as well. My hope is that I will be able to pick back up the 100 Days of Grace and Gratitude within the new few weeks, and I look forward to sharing that journey with all of you. What have your been journaling lately? 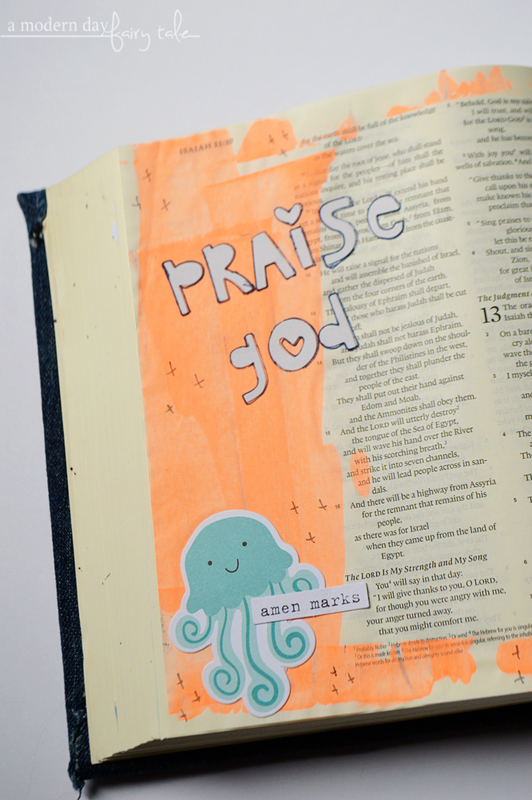 Need a new journaling Bible? Great news! The Illustrating Bible is back in stock, but could sell out quickly! Grab it before it's gone! Not a journaler? What Bible studies and/or devotionals are you currently enjoying? I'd love to do this.These are great kits.